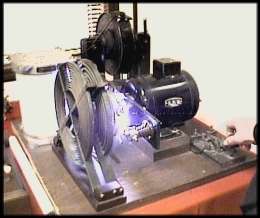 The ROARING 20s was not only an era of tremendous prosperity and invention it also described the operation of this 250 watt spark transmitter built in the early '20s by Moe Smith VE1XG. Moe's transmitter remains in excellent working condition at the Hammond Museum of Radio. 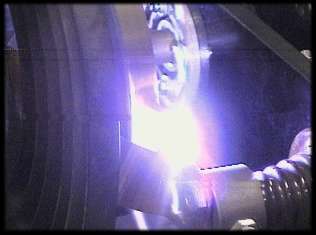 The adjacent photo plus the close-up below, depicts the noisy spark during a live demonstration. 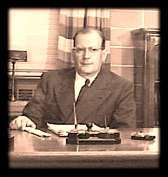 Moe's career in radio saw him become the Chief Engineer for the CBC's International Short-wave Station, CBA in Sackville NB. For a more detailed look at the CBA facility for which Moe was the Chief Engineer, be sure to check out the section on Early Broadcasting elsewhere on this site. Names of vintage radio manufacturers such as Pilot, Federal, Patterson, Sargent and yes, even a Hammond are amongst the hundreds of vintage radios on display. 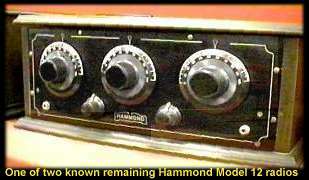 The Hammond Model 12 had a grand production run of several hundred units before RCA decided that it wanted Hammond to purchase a patent licence and pay royalties to RCA for each radio produced. It was decided that the $5,000 fee (1920s dollars) would not make the project competitive so production ceased. Ken Hammond, (brother of Fred) found this radio 35 years ago in a pawn shop. It is believed to be one of only a few remaining models in existence. Bringing the 1,000 plus radios into operational shape over the past number of years was no small job. 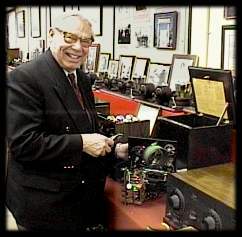 Museum founder Fred Hammond (deceased 1999) is shown in this 1997 photo adjusting the tuning rotor plates in this Federal 110. Fred had discovered this gleaming beauty in 1977 while browsing the attic of a Hamilton Doctor's estate sale. 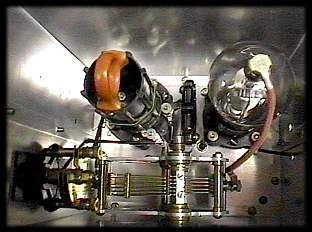 This top down interior view of a Pilot receiver shows the high quality craftsmanship that went into the production of most vintage radios. Keeping each radio in show room condition requires hours of cleaning on a regular basis which becomes obvious when you inspect the factory new look inside most radios. 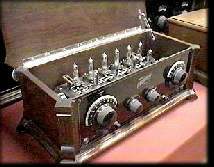 One of the early radios to use peanut tubes was the Mercury Super 10. This beautifully crafted radio is housed in a solid walnut cabinet. Lower A and B battery drain was a feature of the Mercury. The H.M Kipp Company of Toronto Canada, was one of only a few manufacturers who experimented using the early peanut tube technology.